The Bariatric Group has three weight loss surgeons who have passed the international assessment process of the American Society for Bariatric and Metabolic Surgery for Centres of Excellence in Bariatric Surgery. This translates into excellence of care for our clients. The surgeons meet regularly as a team to discuss new approaches to patient care and to ensure that there is consistency of care across all of our surgery centres. Collectively they have performed over 2,500 bariatric surgery operations in the past three years. Mr Richard Welbourn is the Director of Surgery for the team. The Bariatric Group is committed to the highest standards of treatment practice and all of our surgeons have experienced working in both the NHS and private sectors. Their commitment to the advancement of bariatric surgery also extends to the collecting and publishing data on our treatment outcomes and measuring the impact of the treatment on patients. 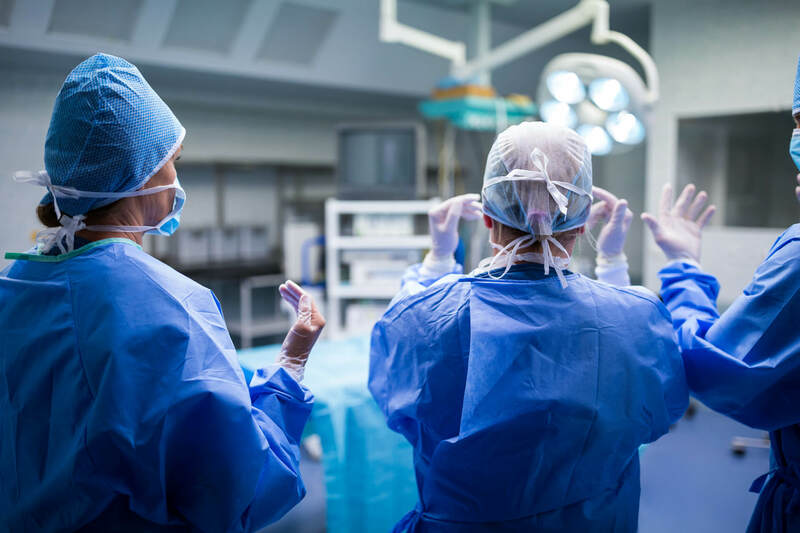 Our team regularly presents data at UK and international medical conferences and several team members hold leadership positions on UK medical bodies such as the Royal College of Surgery, the British Obesity & Metabolic Surgery Society and the Association of Laparoscopic Surgeons. Mr. Welbourn is a senior Bariatric surgeon at both the Musgrove Park Hospital and Nuffield Health Hospital in Taunton. He specialises in laparoscopic surgery of the stomach and upper gastrointestinal tract and regularly trains other surgeons in laparoscopic techniques, including Bariatric surgery. He has been performing obesity surgery operations since 2003, both within the NHS and private sectors. Mr. Welbourn is accredited by the American Society of Bariatric and Metabolic Surgery as meeting the criteria for a surgeon of a Centre of Excellence in Bariatric Surgery. Mr Mahon joined our team in 2006 and performs Bariatric surgery at both the Musgrove Park Hospital and Nuffield Health Hospital in Taunton. Mr Mahon is the Clinical Lead for Upper GI and Bariatric Surgery at Taunton and Somerset NHS Foundation Trust Somerset. Mr Mahon is accredited by the American Society of Bariatric and Metabolic Surgery as meeting the criteria for a surgeon of a Centre of Excellence in Bariatric Surgery. For further information visit Mr Mahon’s website by clicking on the link below. Mr Noble is a Consultant Upper Gastrointestinal and Bariatric surgeon at Musgrove Park Hospital and the Nuffield Health Hospital in Taunton. He has had an NHS practice since 2012 and joined the Bariatric Group in 2014. He trained in London and the South West and was awarded an MS from Imperial College. Prior to his consultant appointment he undertook a Royal College of Surgeons accredited bariatric fellowship at the Centre of Excellence in Taunton and was a visiting fellow at the renowned unit in Bruges. Mr Titcomb joined the team in 2010 after being appointed a consultant upper GI surgeon at the Bristol Royal Infirmary. He spent time working at the Bariatric Surgery Centre of Excellence based in Musgrove Park Hospital Taunton. He was previously a substantive consultant in Gloucestershire, assisting in the development of their weight loss management service. Having been awarded an AUGIS (Association of Upper GI Surgeons) travel fellowship in 2009, Mr. Titcomb worked at the Cancer Institute Hospital Tokyo, Japan, training in advanced minimally invasive upper GI surgery, as well as undertaking bariatric surgery training courses in Versailles and Gothenburg. Mr. Marcus Reddy is a full time consultant upper GI surgeon and bariatric surgery to St George’s Hospital. At St George’s he performs gastric bands, sleeve gastrectomies and laparoscopic roux-en-Y gastric bypasses. He also chairs the weekly multidisciplinary team meeting and clinic. Mr. Marcus Reddy covers the bariatric patient emergencies in the NHS and private sector with experience of dealing with slipped bands, port infections and emergency band removal. His endoscopy experience involves endoscoping patients with erosions, pouch dilatation, roux-en-Y loop sumps, disrupted VBG staple lines, pouch-jej strictures and stomal ulcers. James is a consultant upper GI surgeon at the University Hospital Southampton, and was appointed in 2003 following an advanced fellowship in Brisbane Australia. He has been performing bariatric surgery for private and NHS patients since 2004. James performs gastric band, bypass and sleeve gastrectomy as well as revision surgery.He is a member of the council of the British Obesity and Metabolic Surgery Society, and is also an investigator on the BY-Band-Sleeve study. He is a fully trained Bariatric (weight-loss) surgeon having completed a sub-specialist and fellowship training His other specialist interests are in laparoscopic (keyhole) abdominal surgery, in particular the management of gallstone disease, gastro-oesophageal reflux disease and all types of hernias. Mr Hopkins has a specialist interest in Complex Abdominal Wall Reconstruction for complicated or recurrent hernias.